BŻ-4 Żuk was the second completely Poland, built from scratch, helicopter construction. The helicopter builder was Bronisław Żurakowski, whose brother, Janusz Żurakowski (1914-2004), was celebrating himself as a fighter pilot during the Second World War, and then he was a known and respected pilot in Canada, where he made first flight on the Avro Canada CF-105 Arrow. Bronisław Żurakowski (1911-2009) was a well-known and respected air constructor of the inter-war and post-war period. He constructed gliders, planes and helicopters. He made a significant contribution to the construction of the best Polish helicopter PZL W-3 Sokół and the development of the PZL-104 Wilga-1 aircraft. He was a talented glider pilot. He was the last living constructor of the famous pre-war DWL-RWD company. The BŻ-4 Żuk helicopter belongs to many Polish airplanes. The airframe, engine and accessories are completely Polish. The helicopter did not stand out with anything special. It was supposed to be a simple and useful helicopter. 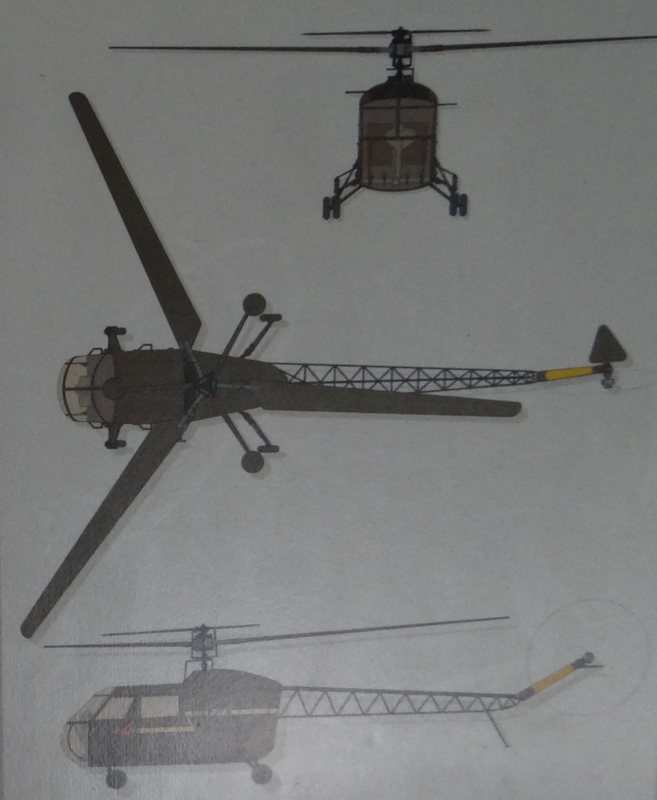 The concept of the helicopter was born in 1953, after a series of successful BZ-1 GIL helicopter flights. At the same time, the name Gil did not mean the name of the bird, only the Central Aviation Institute. Initially, the helicopter was marked GIL-4, to be soon changed to BŻ-4 Żuk. The works started in 1953, in the Office of Helicopter Structures in Okęcie. In 1957, the Design Office of Helicopters was moved to the Aviation Construction Center. BŻ-4 was designed in a classic layout. It was conceived as a machine of uncomplicated construction, which affected the simple shape of the hull body and the raw finish of the cabin interior. The helicopter was pioneering in many respects. The helicopter prototype was built in 1956 at the Experimental Production Plant of the Institute of Aviation. Bronisław Żurakowski did not decide to use a two-blade carrying rotor, but chose a three-blade system. He was afraid of a high level of vibrations. A three-blade rotor bearing received an additional steering rotor, the Hiller system, performing a curative function, and at the same time reducing forces on the joystick. This concept has worked well giving good results. The machine is very stable in hovering, and the pilot does not require much physical effort from the pilot. The rotor blades are mounted directly in the hub and only have the ability to change the chamfer just like in a propeller. The hub with the shaft is connected with the Cardan joint. A control impeller has also been connected to the shaft with the Cardan joint. The control rotor received three circular control surfaces. Usually, constructors of systems with the Hiller system use rectangular control surfaces. Bronisław Żurakowski was concerned with obtaining larger angles of attack, which translated into the effectiveness of control. However, nothing is for free. A three-blade impeller is more complicated than a two-blade impeller. The control impeller as well as the main rotor are connected with pushers with a control disc. Żurakowski's rotor with the Hiller system has become a remarkable phenomenon on a global scale. The rotor blades are of wooden construction. Pine wood was used. The shovels were reinforced with a metal rod and a flat bar. The back part of the blade has a rib structure. The shovels received locks, after release which the shovels can be folded. The third blade is positioned along the tail beam. Bronisław Żurakowski designed the elastic suspension of the main transmission using articulated joints and torsion bars. During flight tests, an upgrade was introduced with an additional system in the gear suspension mechanism, which was coupled to the helicopter landing gear, and precisely the deflection of the front wheel shock absorbers. After starting the helicopter, the characteristics of the main transmission change. In this way, other attenuation was obtained at standstill and others at fly. In both phases, the comfort of people on board a helicopter has improved. The WN-4 engine was used to drive the helicopter, which is a development of the WN-3 engine, used for propelling PZL TS-8 Bies. Adaptation consisted in the use of a cooling fan. The motor shaft connected to the rotor shaft via a planetary gear and a mercury clutch. The planetary gear reduced the turnover in a ratio of 10: 1. The mercury clutch is designed to level the torque so as not to damage the engine or impeller. The clutch belongs to the centrifugal clutches, where the friction materials come into contact with each other after reaching the appropriate rotational speed of the system and are pressed by mercury placed in the rubber tube. The rotational speed of the system pushes mercury out, which in turn pushes against the friction systems that merge and transmit torque. The mercury clutch gently transfers the increasing torque. The constructor of the mercury clutch was engineer Wiktor Narkiewicz. The control of the tail rotor was solved in a novel way. A separate assembly connected the adjustment angles of the tail rotor blades with the general and power stroke. When connecting the main rotor, the pilot did not have to correct pedals of increasing torque from the main rotor. In addition, the plane of the tail rotor was not parallel to the longitudinal axis of the machine, but set obliquely. It eliminated the excessive moment from the tail propeller during the flight at a higher speed, and thus the need for pilot reaction. Thanks to this pilot was easy and fatiguing. The chassis consists of four supports with single wheels. Oil and pneumatic suspension. The vibration crowd is very good. The first flight took place on 10 February 1959 at Okęcie Airport. The pilot of the Institute of Aviation, engineer Ryszard Witkowski, was at the controls. Trials, during which the helicopter took 17 flights with a total time of 3 hours 40 minutes, were conducted until August 1959. Unfortunately, during the trials, no damage was done. 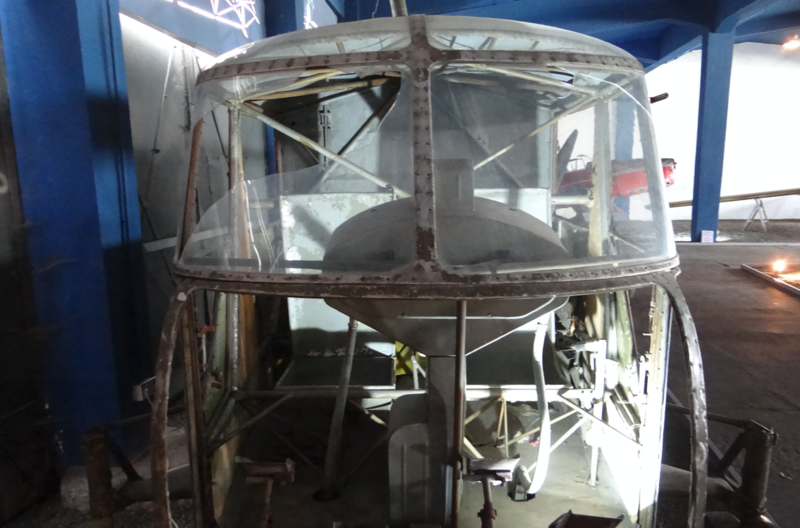 After the last of them, despite the renovation of the structure, further work on the helicopter was abandoned, and two more prototypes were not completed. First of all, the BŻ-4 Żuk helicopter was a competitor for the Soviet construction of Mil Mi-1, and above all the Soviet offer of Mil Mi-1 production in Poland. The Polish plant should not oppose the rulers in the Kremlin. The BŻ-4 Żuk helicopter program was not a government program and a priority program in the Ministry. Therefore, the program was poorly funded. As a result, the team of constructors was small. In addition to Bronisław Żurakowski, there were engineers Wiktor Narkiewicz, Jan Koźniewski and Jerzy Kotliński. There was a large group of skeptics, critics and simply jealous people that the program could succeed. For example, they made it difficult to exchange a subassembly. Repair which should last one hour, lasted several weeks. They still criticized the box-shaped (implicitly ugly) shape. Low-quality materials with low resistance to fatigue wear were provided for fitters. They used every failure for total criticism. At the end of the program they criticized too innovative solutions, not the use of "tested" patterns with CCCP. The team could not use the otics in the rotor head with proven fatigue strength. The constructors had to fasten the helicopter's plate by means of rivets, not by punching or gluing. Therefore, there was increased resonance and noise. As a result, cracks in the structure occurred. Not all of the team of the engineer Bronisław Żurakowski succeeded. It turned out that the engine cooling fan was designed incorrectly. At the moment of passing through the initial resonance (accident of all helicopters in 50-years), several fan blades were broken. The steel elements used to protect the crew and passengers were associated with an increase in the mass of the helicopter. Ergonomics were also faulty. Many elements needed improvement; armchairs, controls, facilitating getting on and off the helicopter. The tailgate was too limp, which entailed a risk of being hit by a shovel. 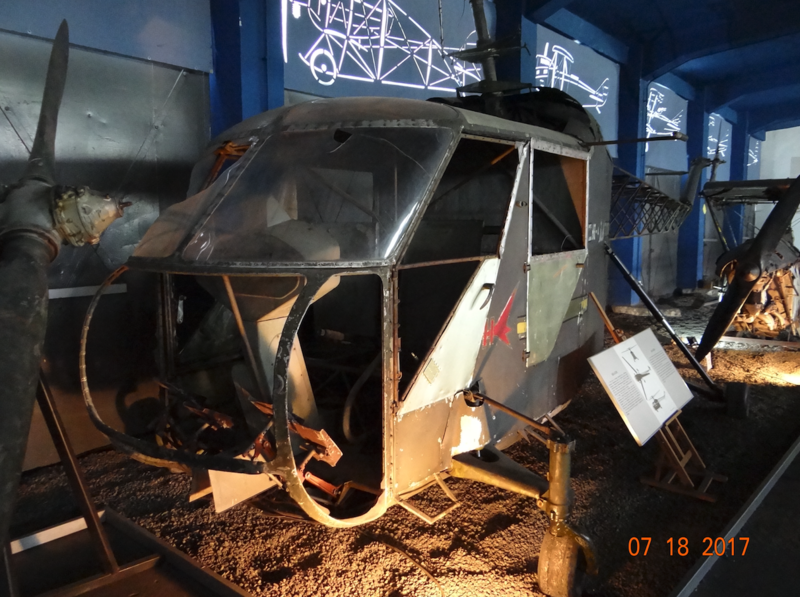 The fact that the BŻ-4 Żuk helicopter was systematically destroyed by many, figuratively and literally, is demonstrated by its condition at the Polish Aviation Museum in Czyżyny. Nobody knows how it happened that when the decision was made, about transferring it to the museum (then the Museum of Aviation and Astronautics), it suddenly turned out that it is a wreck. Many years ago its creators gathered with the intention of his restaurant to form a museum copy. It turned out to be impossible, however, due to the large number of missing devices and details, and practically it would have to be built from scratch. Therefore, it was decided to leave it in the form of the so-called destructure. 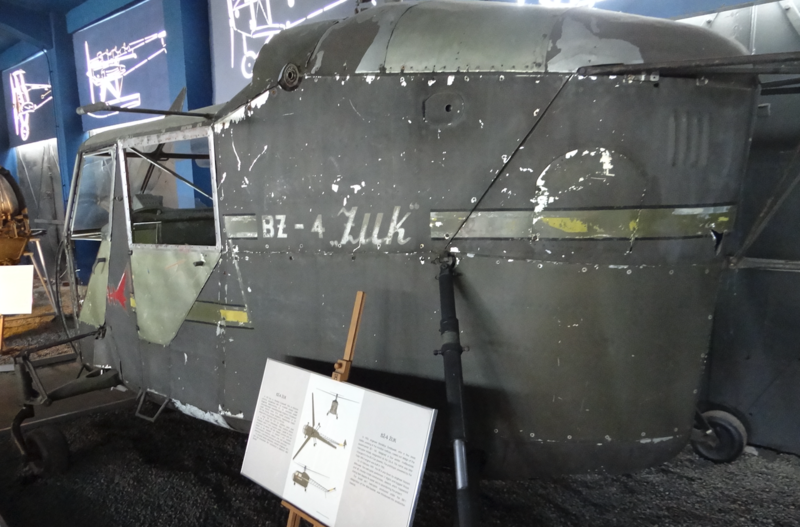 And yet, BŻ-4 Żuk is a great monument of aviation technology and testifies to an unconventional approach to the subject by excellent Polish engineers.